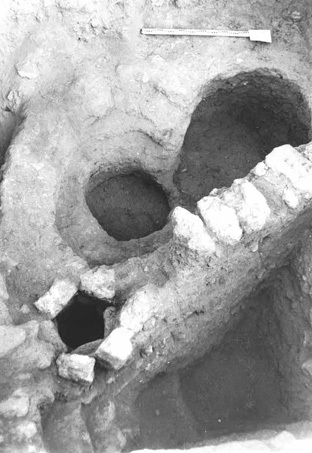 A salvage excavation was conducted in July 1999 at Es-Sawafir el-Gharbiya (Permit No. A-3069*; map ref. NIG 17200–10/62305–15; OIG 12200–10/12305–15; HA–ESI 113) prior to the positioning of a high-voltage pylon. The excavation, on behalf of the Antiquities Authority and funded by the Electric Company, was directed by Y. Baumgarten, with the assistance of Y. Rahamim (administration). Four squares were opened at the top of the tell. The southeastern corner of a building from the time of the British Mandate or the end of the Ottoman period was discovered, as well as the wall of the courtyard that enclosed it. A marble architectural element in secondary use was incorporated into the corner of the building. Several pipes from the Ottoman period were retrieved from the stratum into which the building was constructed. A conduit, a cesspit (?) and a tabun for cooking, shaped like the number 8 (Fig. 1) were uncovered as well. A small stone capital, probably from the leg of a table or an altar, may perhaps indicate the presence of a church that was not revealed. Pottery fragments from the Byzantine period were recovered from a layer of gray soil that was below the Ottoman-period stratum. Two cemeteries from the Byzantine period were found at the site. One, at the top of the hill, consisted of cist graves with gabled roofs of stone slabs; the other, in the eastern part of the tell, included cist graves with flat roofs of stone slabs. Numerous fragments of Gaza jars from the fifth–seventh centuries CE were concentrated next to the two cemeteries and could attest to the possible existence of a pottery workshop. Several bell-shaped water cisterns of unknown dates, which were renovated in modern times, were exposed on the hilltop. A well, whose date cannot be determined and its shaft was built of kurkar blocks, was located at the foot of the hill, to the east. 1. Sewage conduit and tabun, looking south.